Photos from Russia showing what was salvaged of the Hurricane. Bonhams & Goodman’s is delighted to offer here this historic, yet effectively ‘good as new’, fully airworthy Hawker Hurricane MkIIA historic ‘warbird’/ It is the only airworthy example of a Hurricane with 1940 Battle of France history. It is one of currently only a dozen flying Hurricanes in existence worldwide – and it is a veteran of not only the Battle of France, but also the Battle of Britain, the Russian Convoys and the Russo-German Great Patriotic War. 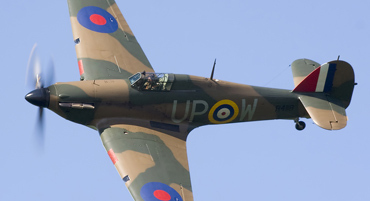 Historically, the handsome, charismatic and for many decades exceptionally rare Hawker Hurricane is recognised as having been the main victor of the Battle of Britain – the three-month struggle in which Great Britain stood alone to defend democracy against Nazi totalitarianism. The Royal Air Force at that time could deploy 32 squadrons of Hurricane fighters, compared to only 19 equipped with the newer Supermarine Spitfire. Overall, the RAF’s 620 Hurricanes and Spitfires (backed by another 84 assorted fighters such as the obsolescent biplane Gloster Gladiator) confronted the aerial threat of 3,500 German Luftwaffe bombers and fighters. And defeated them. 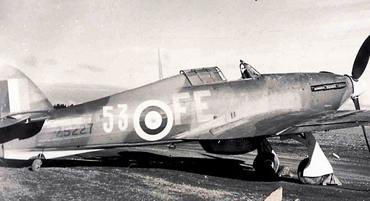 The eight-gun Hawker Hurricane was not only the first RAF monoplane fighter to feature an enclosed cockpit and retractable undercarriage, it was also the first RAF monoplane fighter capable of exceeding 300mph in level flight. The Hurricane embodied Hawker’s many years’ hard-earned experience of fighter aircraft design. Proving itself superbly manoeuvrable yet a stable gun platform, legendarily tolerant of battle damage, reliable and comparatively easy to repair. What’s more the basic design proved itself astonishingly versatile. Hurricane variants se4rviced in almost every theatre of the Second World War. Ironically, since an early batch of Hurricanes had been supplied to Romania, Hawker’s finest also served in the conflict on both sides! The only Victoria Cross – the British Empire’s highest award for valour in face of the enemy – every awarded to a Fighter Command pilot was won by Ft Lt James Nicolson, a Hurricane pilot of No 249 Squadron. On August 16, 1940, while attacking a Luftwaffe bomber his aircraft was set on fire by an escorting Messerschmitt. Ignoring the flames he pressed home is attack to destroy his original target, before – badly burned – parachuting to safety. Meanwhile, the Battle of Britain’s highest-scoring individual Allied pilot – the Czech Sergeant Josef Frantisek – flew Hurricanes to claim his 17 victories. And during the preceding Battle of France the New Zealand pilot Edgar ‘Cobber’ Kain had become the RAF’s leading ace with 16 confirmed victories to his name – again flying Hurricanes. And flying alongside such men during that critical period of world history – and indeed in the same Squadron as ‘Cobber’ Kain – was ‘P3351’ now offered here. Fresh from the Brooklands production line, ‘P3351’ was immediately issued as a replacement aircraft on June 1, 1940, to No 73 Squadron then based at Le Mans, France. The German Blitzkrieg invasion had penetrated deep into northern France, and the Dunkirk evacuation of the remnant British Expeditionary Force was at its height. On a daily basis, No 73 Squadron was fighting a desperate rearguard action against the rampant Luftwaffe. Hurricane ‘P3351’ was uplifted from Rouen on June 3 and on arrival at No 73’s advanced landing ground at Echemines the code ‘K’ was hastily painted upon its fuselage. Flown as part of ‘A’ Flight she undertook defensive patrols over Northern France, covering the retreat of the British Expeditionary Force. On June 7, ‘Cobbler’ Kain was killed in a sister aircraft while beating-up the aerodrome at Bois as No 73 fell back to Le Mans. By June 18 the squadron was based at Nantes, covering the final evacuations from the ports of St Nazaire and Brest. By early afternoon that Tuesday, No 73 was flying its last patrols over its retreating ground crews heading for the coast. German forces were expected to appear at literally any moment. Just after 2.00pm, warning was received of the German approach. The Hurricanes were frantically refuelled, some 18 of them taking off for England. This example, ‘P3351’ was one of the last to leave – flown back across the English Channel by Pilot Officer Peter Carter. The Battle of Britain was then imminent but 73 Squadron was given time to recover from the battle stress of France. ‘P3351’ was cleaned and tidied and the squadron letters ‘TP’ were painted on her flanks. By July 7, No 72 resumed operations, based at Church Fenton (east of Leeds, Yorkshire). On the July 19, ‘A’ Flight flew to Prestwick, Scotland, for night-flying experience. All went well until, in the early hours of Sunday, July 21, pilot of Alf Scott undershot the runway in ‘P3351’, collapsing the undercarriage and tipping the aircraft onto its nose. In fact that night saw three Hurricanes damaged (including another by Scott) and all were set aside for repair – illustrating the inherent ruggedness of the Hurricane airframe. 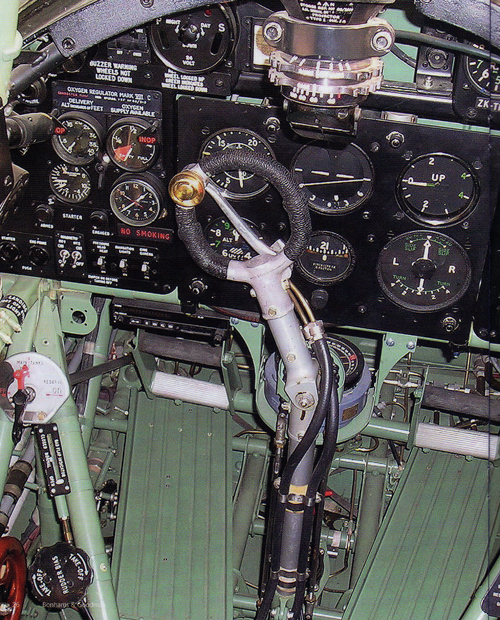 As the Battle of Britain developed in the south ‘P3351’ underwent repair. By early September, with a new engine, she was allocated to No 32 Squadron at Acklington. Having had a torrid time ‘down south’ No 32 had been allocated to 13 Group and tasked with convoy patrols and fighter cover. For three months, ‘P3351’ was flown extensively by Pilot Officer Rose over north-eastern England. On December 16, No 32 Squadron moved south to Middle Wallop, Hampshire, as part of 10 Group. Within 5 days, ‘P3351’ was reassigned – to life with the Americans. Before the United States’ entry into World War 2, in December 1941, many Americans had volunteered for service in the RAF and RCAF, most notably volunteering for the celebrated Eagle Squadrons. No fewer than 244 American pilots flew with No’s 71, 121 and 133 RAF Squadrons. Airframe records are incomplete for this period and although ‘P3351’ arrived on December 21, 1940, her first recorded flight February 16,1941. On March 10 two of the squadron Hurricanes undertook a patrol over the Humber estuary. 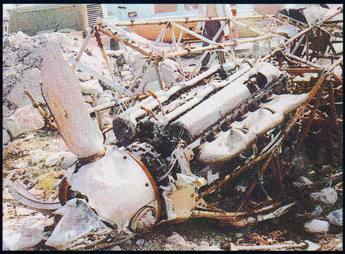 Upon returning in the early evening, Pilot Officer Sampson-Taylor crashed and damaged ‘P3351’ on landing. After a month under repair, this Hurricane rejoined the same squadron, by then based at Martlesham Heath, near Ipswich, Suffolk, ready for further operational flying during the following month. By the beginning of May, 1941, new Hurricane IIAs began to arrive as replacement aircraft and ‘P3351’ was transferred to No 55 Operation Training Unit at Usworth, near the Scottish border. We know her squadron code was ‘PA’ but are unsure of her individual letter. Upon her return two remarkable coincidences occurred. Trainee Pilot Officer William Miller, from Invercargill, New Zealand, flew the aircraft twice. 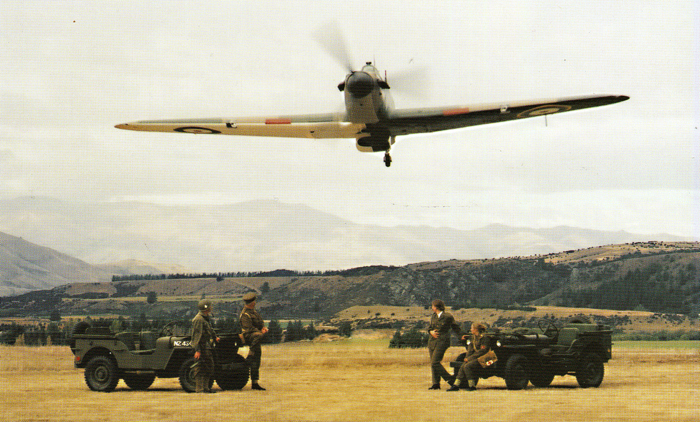 ‘Dusty’ Miller was to retire in Wanaka, New Zealand, where decades later he would be reunited with ‘P3351’, acting until his death as a guide at the New Zealand Fighter Pilots Museum, especially proud to show visitors ‘his’ Hurricane – resplendent in its original colours and markings. Meanwhile, on September 9, 1941, another Invercargill pilot, Sergeant Ness Polson was flying ‘P3351’ on an evening training mission when – officially – the Merlin engine overheated, and abruptly seized. Polson bellied her into a field near Headingly, Leeds. Unofficially, it seems that Polson was competing with his wingman to see how low each could fly. Polson won – flying low enough to hit a hedge which precipitated the forced-landing. This ended Hawker Hurricane ‘P3351’s English flying career. She was collected from the Yorkshire filed, repaired and upgraded to improved specification before being consigned to storage. She was re-serialised from ‘P3351’ to ‘DR393’ and in January 1942 again up-graded by Hawker to Mark IIA Series 2 spec. 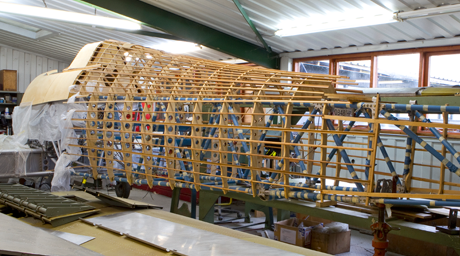 In Russian hands, ‘DR393’ was quickly de-crated and re-assembled. She then flew in Soviet service – cannon-armed – for the following year. No operational details have been located but she would undoubtedly have resumed combat against the Luftwaffe. It is believed she ultimately crashed in the winter of 1943. During the subsequent rebuild process, a 7.9mm copper-jacketed projectile was found lodged in the oil-cooler, having passed through the radiator from the lower face. Possibly ground fire, it is certain that this was the bullet which brought her down.